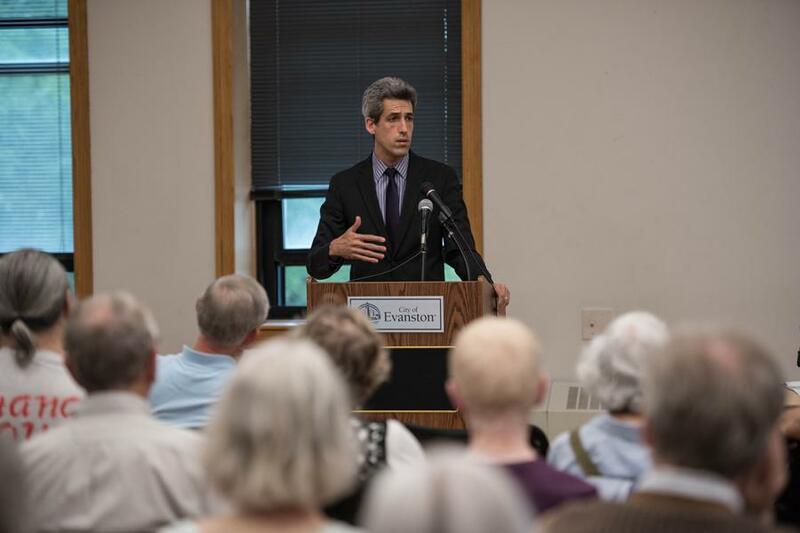 State Senator Daniel Biss addresses roughly 70 local residents at an Evanston town hall meeting Tuesday evening focused on the state budget impasse. Biss broke down the circumstances behind the impasse, explaining what has happened in Springfield since Gov. Bruce Rauner entered office. When state Rep. Laura Fine (D-Glenview) said she was “irked” by the media’s reporting that there is no compromise or collaboration in Springfield amid the budget impasse, some locals saw the issue in a new light at Tuesday’s town hall meeting. State Sen. Daniel Biss (D-Evanston), Rep. Robyn Gabel (D-Evanston) and Fine engaged in a discussion with roughly 70 Evanston residents at the meeting about the challenges legislators face in Springfield regarding the state budget impasse and other unresolved issues. Fine pointed to last summer, when she said legislators would go down to Springfield every week to meet and discuss the impasse. She said they also brought in experts to advise them as well as to get feedback on Gov. Bruce Rauner’s “turnaround agenda,” a plan to reshape Illinois by fixing the state budget and creating economic growth. Gabel spoke to some of the several consequences that have come from the state budget impasse, such as funding cuts to state colleges and universities which have led to rises in tuition and faculty layoffs. In addition, nearly 10,000 kids are no longer eligible for child care, co-pay across the state increased by 20 percent and there were major cuts to the public healthcare system, she said. “We all read the newspapers and the blogs and we get some information, but we wanted to make sure you get the whole picture,” Gabel said. Beginning the story on Dec. 31, 2014, about two weeks before Rauner took office, Biss outlined how Illinois has gone nearly an entire year without a state budget and what has been happening in Springfield since then. Upon opening up the floor to attendees, questions were raised about other unpassed laws such as a house bill on gun violence, the clean jobs bill on renewable energy, pension reform, education and what the three state legislators at the meeting describe as the “fallacy” of the Democratic supermajority in Springfield. Despite this, the worries of Illinois residents still stand. Sherman said he is concerned that if the state budget impasse does not get resolved soon, the state’s reputation will continue to go downhill, which he said will destroy the state’s economy in the long term.